Residential and commercial brokerage. Includes services, rates, refinancing information, list of lenders. Located in Guelph, Ontario. Reviews and Comments for Park Capital Inc.
Focus: raising pools of capital from individuals involved in professional sports and investing it with a small number of top-tier venture capital funds. Financial advisory firm focused on private companies in technology, healthcare, and outsourcing industries seeking to raise capital in the institutional capital markets. Focus: venture and expansion capital for private companies and growth capital for public companies in a wide range of industries. Focus: private equity and venture capital investments for International investors who need protection of capital and tax-free returns. Directory of venture capital and private equity firms and venture capital marketplace for entrepreneurs, investors and advisors. Aetna Capital provides asset based loans starting from just $100,000 to $1,000,000 plus fundings. Aetna Capital can provide the financing to make your company prosper. Waterside Capital is a publicly held company headquartered in Norfolk, VA. Founded in 1993, the company is a licensed Small Business Investment Company (SBIC) and has $50 million in capital to invest. A commercial real estate capital advisor. Arranges debt, mezzanine and equity capital for real estate owners and developers nationwide. Provides grouth capital and global sourcing for consumer product companies. Venture capital and business plan consulting services. Focus: venture capital funding using private placements and IPOs. Provides commercial financing, venture capital, equipment leasing and factoring. Focus: global venture capital research and advisory services. Focus: short-term growth capital to technology companies. Provider of private equity and venture capital in Australia and New Zealand. Marketplace where financial sources compete to provide capital to companies. Focus: venture capital and equity raising services. Venture capital database and web application to help companies raise capital. Publishes news and research on venture capital deals. Offers mezzanine financing, capital acquisition and consulting services. Provider of mezzanine and equity capital to middle market companies. Private investment bank advising companies in planning for their capital needs. Provides working capital and accounts receivable financing to trucking firms. Offering management consulting, capital raising and strategic advise for public and private companies. Focus: venture capital or investment capital for small to mid-sized fast growing businesses. Focus: growth financing and mezzanine capital for leveraged acquisitions and recapitalizations. Focus: equity capital in companies engaged in a variety of industries throughout Texas and the Southwest. Offering funding and support programs for companies seeking expansion capital. Prepares entrepreneurs or companies seeking investment capital and unites them with investors. Focus: invests in all stages of a companys development, from seed capital through mature growth. Growth capital for successful British Columbia businesses and non-profit organizations. If the business hours of Park Capital Inc. in may vary on holidays like Valentine’s Day, Washington’s Birthday, St. Patrick’s Day, Easter, Easter eve and Mother’s day. We display standard opening hours and price ranges in our profile site. We recommend to check out parkcapitalmortgages.com for further information. 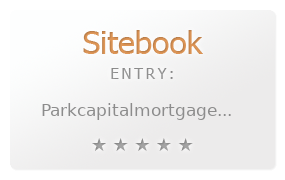 You can also search for Alternatives for parkcapitalmortgages.com on our Review Site Sitebook.org All trademarks are the property of their respective owners. If we should delete this entry, please send us a short E-Mail.